A large majority (75%) of taxpayers overpay on taxes and receive a tax refund, according to IRS data. A smaller proportion (19%) see the opposite: They will have overestimated their withholdings and learn they still owe the IRS some money. 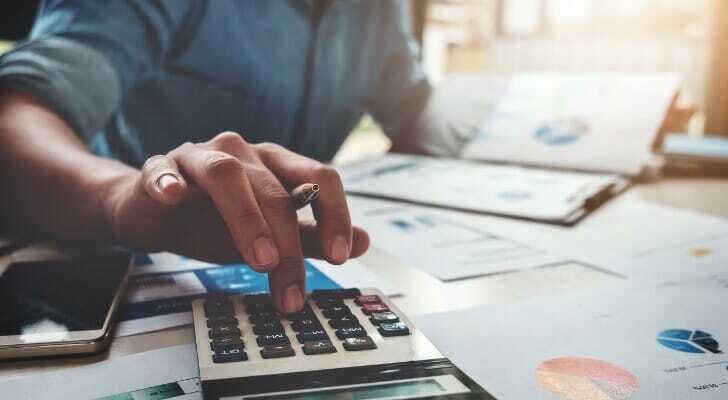 Apart from overpaying and underpaying, there is another small, exclusive group of savvy Americans who manage the Goldilocks fantasy: withholding just the right amount so, come tax time, the tax balance between them and the IRS reads an even zero. 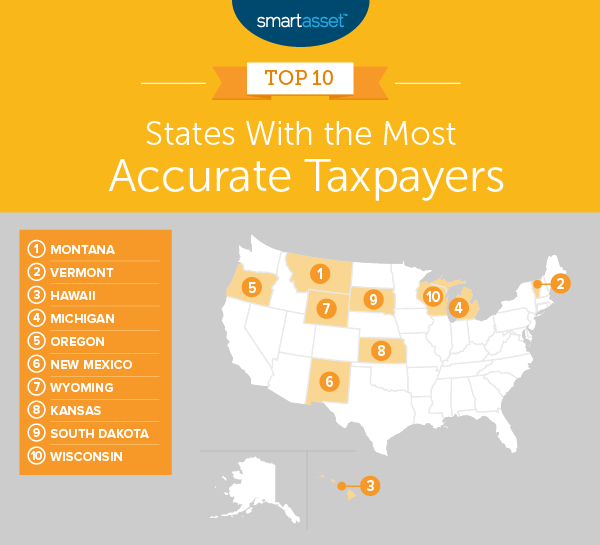 In order to find the states with the smartest taxpayers, we looked at data on three factors. Specifically, we looked at the total number of tax returns, the number of tax returns with overpayments and the number of tax returns where taxpayers underpaid. Check out our data and methodology below to see where we got our data and how we put it together to create our final rankings. Overpaying on your taxes is common – If you receive a tax refund, you are far from alone. On average, across the 50 states and Washington, D.C., around three-quarters of taxpayers received a tax refund in tax year 2016. Only about 19% underpaid their taxes and owed money at the end of that tax season. Southern states miss their mark – Nine of the bottom 10 states where taxpayers either overpay or underpay on their taxes the most are in the South. On average, only about 4% of taxpayers in those states pay their taxes exactly right. Montana has the most efficient taxpayers in the country, according to IRS data. Of the 500,680 tax returns Montanans filed in tax year 2016, nearly 8% paid the exact right amount of taxes. That means come tax time they did not have to worry about receiving their refund or coming up with some cash to pay taxes they owed. In Vermont, roughly 7.5% of tax returns paid the correct amount of tax in tax year 2016. In every state, the number of residents receiving a refund far outnumbers those who underpay on their taxes and find out they owe money. Roughly 74% of Vermont residents received a tax refund in tax year 2016, while 18% had to pay extra taxes. Hawaii is the last state where more than 7% of residents find they are neither owed money nor owe money by April 15. This state actually has one of the higher rates of residents underpaying on their taxes throughout the year. Roughly one in five Hawaii tax returns indicate taxpayers underpaid on taxes throughout the year and find out they owe money to the IRS. More than 76.4% of Michigan tax returns indicate taxpayers overpaid on taxes in tax year 2016 and, as a result, got a refund. That may sound like good news, but it isn’t really. A tax refund is your money the government borrowed, interest-free. Roughly 17% of Michigan taxpayers underpaid on their taxes in tax year 2016, meaning they took an interest-free loan from the government that they had to pay back. That left 6.8% of Michiganders who paid their taxes just right. Nearly 1.9 million taxpayers filed a tax return in Oregon in tax year 2016. Of those, 1.35 million overpaid on their taxes, meaning they received a tax refund. By contrast, only 424,300 people underpaid on their taxes. That left 6.42% of taxpayers without an obligation to receive a refund or pay on owed taxes. More than 76% of New Mexico taxpayers overpay on their taxes and receive a tax refund. The average taxpayer receiving a tax refund in New Mexico gets a check of $2,836 in tax year 2016. That was below average compared to most states but still a good chunk of change. Once again though, it’s important not to think about the tax refund as a gift. A tax refund was always your money, but you are simply receiving it in a lump sum. About 6.26% of New Mexico taxpayers were extra intelligent and got it just right in tax year 2016, neither overpaying nor underpaying. Exactly 6.2% of Wyoming taxpayers paid their taxes correctly on the first attempt in tax year 2016. The Equality State collects no individual state income tax, which makes paying taxes there a bit simpler. Of the 93.8% of taxpayers here who still had some work to do after paying their taxes in tax year 2016, the vast majority received a tax refund. Slight fewer than 6.1% of Kansas taxpayers got it exactly right at tax time in tax year 2016. Of the 1.3 million taxpayers in Kansas in tax year 2016, 252,620 ended up owing money to the IRS after paying their taxes. Just under 1 million, on the other hand, found they paid too much tax and received a tax refund. South Dakota has no additional income tax. That makes paying taxes here about as straightforward as it can get. Still, only 6.02% of taxpayers paid the exact right amount of tax here in tax year 2016, the ninth-highest rate in the study. Like in most states, roughly 3.5 times as many taxpayers received a tax refund as underpaid their taxes. Slightly more than 6% of taxpayers here paid the exact right amount on their taxes in tax year 2016. In fact, 75% of Wisconsin taxpayers overpaid in tax year 2016, while 18.8% underpaid. In theory, it is better to be in the group underpaying on your taxes, but in practice, finding out you are owed money rather than that you owe money may bring you more satisfaction. Total tax returns. This is the total number of tax returns filed. Data comes from the IRS and is for tax year 2016. Total tax returns with underpayments or overpayments. This is the number of taxpayers who are either owed a tax refund or owe the IRS additional tax payments. Data comes from the IRS and is for tax year 2016. To create our rankings, we subtracted the number of tax returns with underpayments or overpayments from the total number of tax returns. This gave us the number of tax returns without underpayments or overpayments. We then divided that number by the total number of tax returns. This final number was the percent of taxpayers who neither underpaid nor overpaid. We ranked the states from highest to lowest based on this number. Adjust your withholdings – It may feel nice to receive a large check after paying your taxes. But it is probably not the savviest financial move. Instead, it probably makes sense to adjust your withholdings to make sure more of your paycheck goes to your bank account throughout the year. Save it – It can be tempting to splurge when receiving your tax refund. But instead of going on a shopping spree, why not use this windfall to plug any gaps in your finances? If you do not have an emergency fund, for example, putting your tax refund toward building one up in a high-yield savings account is a good move. Though if you have outstanding short-term debt, like credit card debt, you would be best served using at least some of your refund to pay that down. Ask an expert – Managing your taxes in the context of your greater financial picture can be tricky. If you live a complicated financial life and are not sure if you are paying the right amount in taxes, you probably want some professional help. A financial advisor can help you manage both your taxes and your investments to make sure you are on track to hit your financial goals. If you are not sure where to find a financial advisor, check out SmartAsset’s financial advisor matching tool. It will match you with up to three local financial advisors tailored to your particular needs.